The Temple of Heaven in Beijing, China is one of Beijing’s top attractions for both foreign and local folks who come here to pray and play cards. I’m watching the Women’s Marathon at the Beijing Olympics and they just ran through the Temple of Heaven, one of the big Beijing attractions where the emperor, and now regular people come to pray. The architecture there is a lot like that of the Forbidden City, and although the Temple of Heaven is a large area it has far fewer buildings than the Forbidden City. Kudos to China’s Tourism Marketing folks (ha – maybe the same as their Olympic folks?) for getting Beijing attractions in front of billions of people. 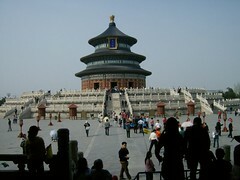 This entry was posted in Beijing, china, tourism, travel and tagged Beijing, china, temple of heaven, travel. Bookmark the permalink.